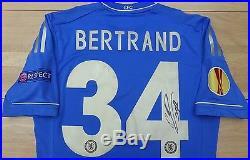 2013 Europa League SF Chelsea v Basel Match Worn & Signed Bertrand Shirt (10094). Ryan Bertrand’s actual match worn Chelsea shirt from the UEFA Europa League Semi-Final 2nd Leg match at Stamford Bridge v FC Basel, May 2nd 2013 beautifully hand signed on his number 34 by Bertrand. This unique shirt is Techfit Player Size 8 with UEFA badges to both sleeves and clear signs of match use to the name and number, despite being laundered. 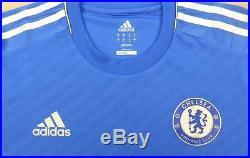 A wonderful rare shirt for the specialist Chelsea collector. Certificate of Authenticity (COA). Below is an example of the COA you will receive. Your COA will match your item. A Footy Autographs certificate of authenticity will be vital should you ever wish to resell your memorabilia in the future so keep your COA safe. We always aim to respond to messages within 24 hours however you will often get a reply within the hour. The item “2013 Europa League SF Chelsea v Basel Match Worn & Signed Bertrand Shirt (10094)” is in sale since Tuesday, February 21, 2017. This item is in the category “Sports Memorabilia\Football Memorabilia\Autographs (Original)\Signed Shirts\Premiership Players/ Clubs”. The seller is “footyautographs-co-uk” and is located in Maidstone, Kent. This item can be shipped worldwide.